The 2016 ‘Bureau Veritas Engineering Cadet of the Year Award’ was presented to Engine Cadet, Peter Lynch on merit of a recommendation from his sponsor, Trinity House and his Year Head, Mr. Stefan De La Cour. Each year the Bureau Veritas Award shall go to a Cadet that has demonstrated a great willingness to help his/her classmates, has displayed good team skills and has exceeded expectations from an academic and practical point of view. 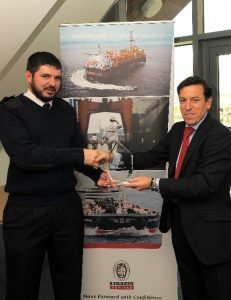 The award was presented to Cdt. 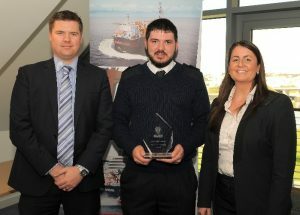 Peter Lynch in the National Maritime College of Ireland on October 20th 2016. In attendance was Head of College, Mr. Conor Mowlds, Head of Dept. of Maritime Studies, Mr. Vivion Gough, Mr. Yannis Calogeras, UK & Ireland Marine Chief Executive with Bureau Veritas, Mr. Phillip Robson, Principal Surveyor with Bureau Veritas, Maritime Liaison Officer, Ms. Annette Coughlan, Mr. Stuart Benge of Chiltern Maritime and NMCI Lecturer of Engineering, Mr. Stefan De La Cour. 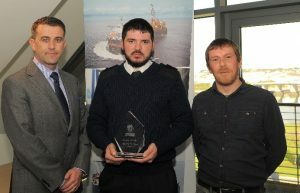 The National Maritime College of Ireland strives to encourage team work, collaboration, and training opportunities amongst all its students and staff. With successful ongoing projects such as PALS – Peer Assisted Learning & Support (CIT/NMCI’s Peer Mentoring Programme) students are given an opportunity to share experience, knowledge and offer guidance to their peers. This line of support allows cadets such as Cdt. Peter Lynch to inspire students to follow in the footsteps of those who walked before them and grow as individuals whilst focusing on a successful maritime career.